Yet another pair of Homo sapiens subspecies brittanicus arrived this afternoon but this pair was attempting to disguise itself as subspecies gallicus by travelling in a French registered car pulling a French registered trailer tent. It’ll soon be time for us to move on so, once again, Francine and I were out armed with pixels searching out Odonata. On this trip, I have been religiously checking all apparent Black-tailed Skimmers (Orthetrum cancellatum) to make sure that they weren’t White-tailed Skimmers (Orthetrum albistylum) which, somewhat unexpectedly, look very similar to each other. 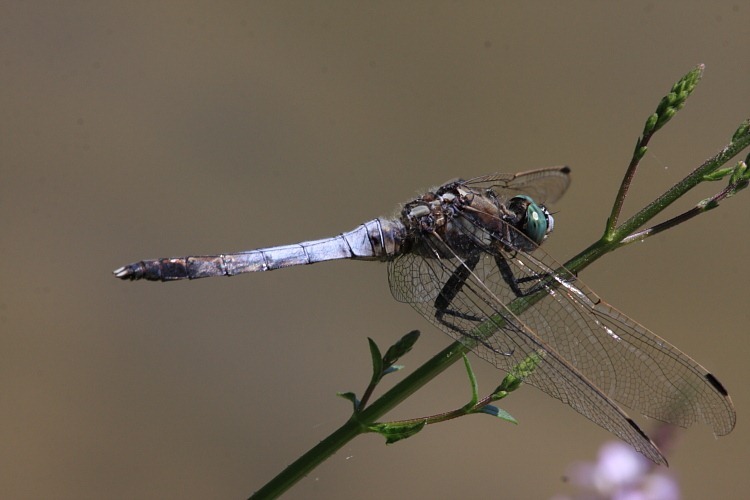 Thus far, I had not noticed any White-tailed Skimmers chez nous at farmer Luc’s lake. Hawk-eyed Francine was in the lead and disturbed a perched Skimmer. “That looks like a White-tail”, she said. “B****r me, it is!”, I exclaimed, as it returned to its favoured perch and allowed me a decent look. Inwardly grumbling slightly at Francine’s fortune, I did a little rare gardening to rearrange the obscuring vegetation for a clear shot and began snapping away, reusing pixel after pixel, until I had a considerable collection of images from various angles to maximize my chances of a successful capture. Francine continued on her way to stake out Farmer Luc’s digue [dyke]. Mr. Plumy (lt. col., retd.) glanced up and spotted me with my monopod slung across my shoulder. “Do you work here?”, he enquired. Now, here we are on a dairy sheep farm in rural southern France. Admittedly I do not look French but, were I to have been a local farm worker which, given his question, he suspected (my monopod across my shoulder probably resembled a yokel’s pitchfork), what is the chance that I would have understood his English with no attempt whatever to communicate in the local language? Remember, this pair was driving an entirely French-registered outfit so may well live in France. I bit back my incredulity and replied, “no but I camp here”. He first went on to explain that there was “no electricity” in the “upside down sockets”. He’d tried three appliances, all to no avail, and produced an electric massager as an example ❗ which, he said, was alright this morning in the hotel. Fascinating. I checked the setting of the contact breakers and tried it at our pitch and eventually it whirred into life. I resisted the opportunity of a quick power massage and returned to Mr Plumy whereupon he produced an extension lead with an indicator lamp glowing orange, forcing him to change his claim to, “there isn’t much electricity because it won’t drive the massager”. Mrs Plumy drove back up to the farm to assert the lamentable lack of electricity. I plugged the massager into all four “upside down” [not!] sockets and fired it up, still manfully resisting the opportunity of a power massage. “It’s all fine now”, I said and added that there was ample electricity to run the entire contents of our caravan simultaneously. With some relief, I left him with power as far as his first extension lead (with the pretty orange light) and trying to run it the remaining distance to his trailer tent as I continued on my way to join Francine. Mrs Plumy returned across la digue and paused to ask if we were photographing frogs, adding that the entire site was apparently now without electricity. “We’ve had an entire week like this,” she added as my suspicions grew. Sure enough, Guillaume was now running on his leisure battery. Famer Luc arrived, reset the main contact breaker which Mr. Plumy had undoubtedly caused to trip then, bless him, working entirely in English, went and debugged Mr. Plumy’s (lt. col., retd.) electrical efforts which appeared to centre around a portable refrigerator. This was probably more an act of self-preservation than generosity on Luc’s part, whose regular farming activity had been interrupted, but Luc and Nadine are very generous people. Luc gave me the key to the electricity control room in case of an encore. “Thank you”, said Mr. Plumy unabashed and in English. Clearly the Plumies were very far from being shrinking violets. 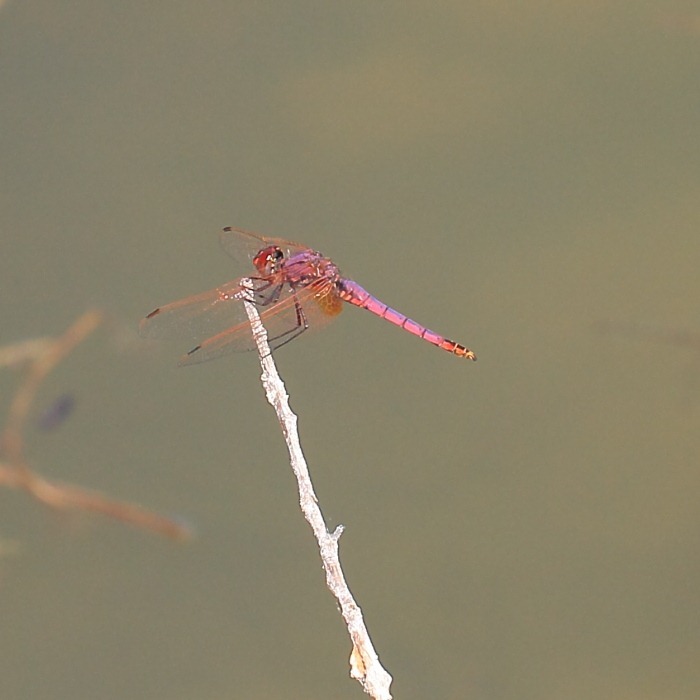 To cap it all, while I had been distracted trying to help the Plumies, hawk-eyed Francine had spotted an Odo she didn’t recognize but which she described as being, “like a Scarlet Darter but pink-coloured”. She grabbed a single, quite distant shot before it vacated its perch which was eventually reoccupied by a normally red-looking Scarlet Darter. Dubiously, we wondered if the apparent pink colouration had been a trick of the light. Strewth, no! When we loaded the shot and I saw it, this was very clearly an utterly stunning, never before seen by us and on the northern limits of its range, Violet-marked Darter (Trithemis annulata). Magnificent! I was glad we had a shot but was decidedly green at the gills for having missed it in the flesh. I may be camping at la digue for the remainder of our stay. I may even change the end of our stay. I think there should be a test before any one is let loose with a caravan or a tent. Probably along the lines of bush survival, that way Darwin will weed out the weak and useless permanently. Oh did I fail to mention that there would be no Health and Safety rules applied.